FOR SALE PAGE .... These prices are the bottom dollar due to herd reduction! FULL BROTHER TO MOS RUNNIN HUCKLBERRY (aka...Hucklberry)! TO GO PLACES SO HE LOADS AND UNLOADS EASILY. HE IS IN YOUR BACK POCKET ALL THE TIME. Due to unforseen cercumstances Runnin Dakota passed away ten hours after giving birth to this sweet guy. Vet said it was a prolapsed uterus. So little fella has been on a bottle ever since. He is doing very well and the vet is overwhelmed at how much he eats. His growth should not be stunted due to all the exercise and groceries he is getting along with the added vitamins. Need to reduce my herd so he is Offered for sale @ $ 1500.00! This little filly is supper quick. She stops on a dime and can turn around before you blink. She loves attention! She is halter broke and is currently turned out in our pasture to grow and build her muscles! This little filly is growing like a weed...Her mane and tail are white with some strawberry highlights. She is super sweet and loves to be around you....out in a pasture with her mother and aunts she is the first one up to greet you everyday! Need to reduce my herd so is Offered for Sale @ $250.00. This fillies mane and tail are still strawberry in color. and she is still super sweet and the first one up to greet you. Price will increase when she is put into training so get her while the price is low! SOLD! Full sister to Manana's Miracle. This filly is a brick house. She is all horse with power! She is super sweet and quick! She is also halter broke and turned out in our pasture to grow and build more muscles. Need to reduce my herd so is Offered for Sale @ $250.00. This fillies full brother is now cutting cattle and very cowy....so if you are looking for one that is able to go in any direction her is your chance to own one....Price will go up when she is put into training so get her while the price is low! SOLD! 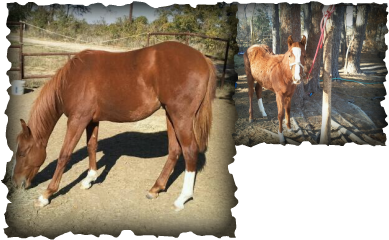 MOS RUNNIN HUCKLBERRY (APHA REGISTERD) IS OUT OF HC SHORTY MAS MANANA AND RUNNIN DAKOTA. YOU CAN LOOK UP HIS PEDIGREE ON WWW.ALLBREEDPEDIGREE.COM. 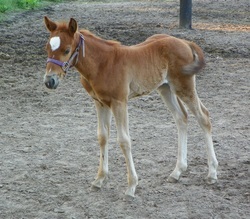 HE IS A COLT BORN APRIL 2011. 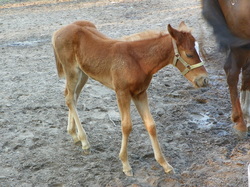 THIS YOUNG COLT IS COMPLETELY HALTER BROKE AND HAS HIS FEET DONE REGULARLY. HE LOADS IN THE TRAILER AND BACKS OUT. HE HAS BEEN HAULED TO BARREL RACES AND STANDS TIED TO THE TRAILER QUIETLY. THIS YOUNG HORSE CAN FLY AND IS BUILT TO DO WHAT EVERY YOU CHOOSE. HIS DAM IS A FINISHED BARREL HORSE AND THE SIRE IS A FINISHED TEAM ROPING HORSE SO HE SHOULD GO IN ANY DIRECTION. HE SHOULD MATURE TO BE BETWEEN 15-16H TALL Need to reduce my herd so is Offered $3500! Check out his pedigree at http://www.allbreedpedigree.com/mos+runnin+hucklberry Small PICTURE WAS TAKEN ON 1/14/12. Large PICTURE WAS TAKEN ON 11/17/12. I have updated pictures of this colt....he has turned out to be a very nice colt. In the spring he will be put in training and the price will be firm. He has start his training....and doing excellent! This is one nice, nice colt....super smart....let him go for weeks and he does not forget what you taught him the last time he was rode. He just keeps on surprising me each day....if he is not sold soon I might have to keep him. 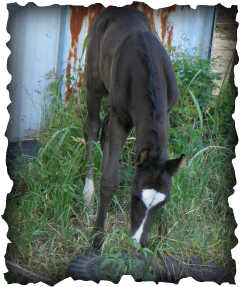 This colt has had 15 rides and he is doing very well and is naturally turning off of his hind quarters.